Will it go the way of Bengal's old capital Gaur? 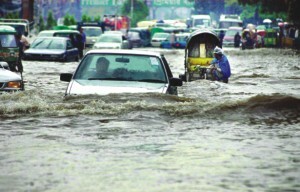 Thursday June 7, it rained 109 mm in Dhaka. Leaving a literary event at the Sheraton I sought a ride home with a friend. Since the entrance was flooded, we agreed to cross over to the other side where his car would pick us up. Joloboddhota. Waterlogging is today a word linked to the city as inextricably as janjot, chintaikari, and oggan party. There is no mystery behind Dhaka's flooding. When rain pours down, it must drain. The city's drainage sewers are often blocked. Box culverts compound the problem. Perhaps the biggest culprit is the filling up of the city's canal system. I grew up in a house, now history, in Bangla Motors. Like much of the city, it was on low lying land. Even to raise it above the original level, my father cut a pond right in the back. In the monsoon, the pond rose and flowed into the doba behind the house. The water found its way through other channels and crossed under Mymensingh Road into the Begunbari canal that lies behind today's Sonargaon Hotel. I remember catching fish in water that sometimes came nearly to the verandah. Today water is locked into a few so-called lakes. Instead of an intricate network of water, we have an extensive mesh of money: the outcome of the market, greasy palms, and criminalised politics. As land prices skyrocket, people with ability buy up or grab wetlands, developers rush in, and government colludes. Landowners amass fortunes, developers make millions selling apartments and commercial property, bureaucrats stuff their pockets, and even workers at the bottom fill their sunken stomachs with one more day of kamlagiri. Left to themselves, humans focus on today -- many on today's survival, others on today's get rich opportunity. What will happen tomorrow? When the next big flood strikes? When global warming raises the ocean level and the lower delta goes under? Where will the water in Dhaka go? By filling the canals, we have killed the future of the city. Unless we can take drastic action -- and soon, there may be no future for Dhaka. Along came Katrina, the worst hurricane to hit the city since Camile in 1969. The levees collapsed at vital points. Water came rushing up the MRGO, possibly helping to explode one of the levees. Large parts of the city went under water. Neighbourhoods where poor and working class people lived -- mostly black in New Orleans and white in St Bernard Parish -- were flooded. On my visit just before the one-year anniversary of Katrina, the writer Kalamu Ya Salaam who grew up in the Ninth Ward drove me around. While much of the debris had been removed, hundreds of houses lay wrecked. Thousands more stood abandoned. Though intact on the outside, the flood had destroyed the insides. We saw some people trying to rebuild. A heroic effort, mostly relying on their own resources. Those without such resources, without the ability to rebuild and make a living at the same time, now lived elsewhere. Kalamu pointed to houses where he and his relatives lived decades ago. Such areas would soon be reclaimed by nature. At the edge of the neighbourhood we walked up an embankment to view what remains of wetlands that were once pervasive. He remembered fishing there as a kid. Now they were waterlogged pools of stagnant water.